I'm in a bit of a hurry today. Daughter and I are going to attend a pink party and I supposed it's gonna be a fabulous one. 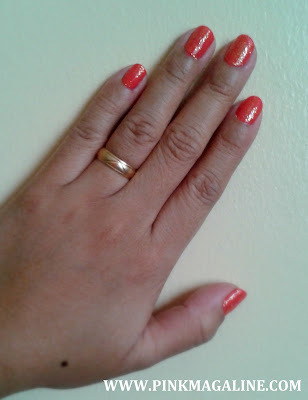 Before leaving the house, I just have to post a quick update by showing you my nail polish for the week. I actually did this yesterday, then daughter wanted to have the same color for her nails so I painted hers this morning. 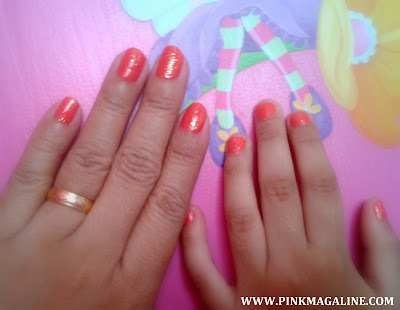 So yeah baby.. we have a mother-daughter manicure again. Hihi. 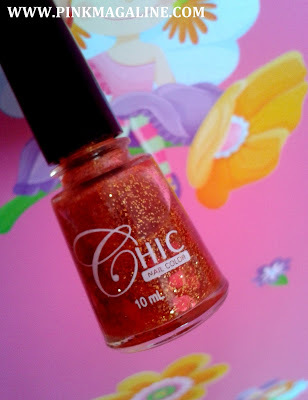 My first time to buy a nail polish from Chic. This one is called 'glaze'. Glaze because it has yellow glitters in it.. and pink hearts too! To achieve the 'fruity glaze' nails, I first used Caronia clear, made it dry and then applied Sally Hansen's Frutti Petutie. The Sally Hansen nails polish is really pink. The color changed when I finally coated it with Chic's glaze. Anyway, this polish will stay for a week thus I call it NOTW or nail of the week. PS. Sorry for the quality of photos. I only used Samsung phone for this post 'cos my Canon is still charging. Grabeh nakakatuwa naman, I just saw this kahapon and was thinking to buy it.. Pero I bought the one yung kaleidoscope yung bago nila :) Have you tried it?